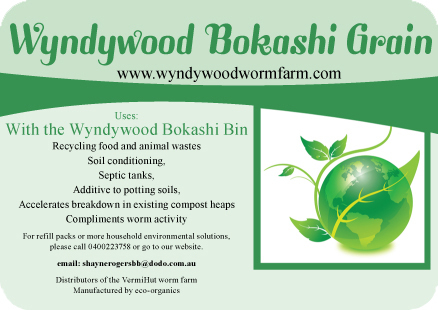 Bokashi Grains which can be used in our Wyndywood Bokashi Bins come in 2 blends. Firstly our standard Bokashi grain which is composed of crushed Australian grain (usually barley, wheat, and/or rice mixture), fermented with natural beneficial microbes, minerals, salts and natural sugars. This blend has a moderate nutrient value on its own, but is also teeming with millions of beneficial microbes which go straight to work when in contact with organic material such as the food in our Wyndywood Bokashi Bin or the organic matter within your soil. Recycling food waste,Controlling natural odours,Conditioning soil, Septic tanks- active promotion of waste breakdown, adding to potting soils, accelerates breakdown in existing compost heaps. Also great for recycling animal waste, but please refer to grain blend (shift) below. Compliments worm activity in your worm farm, compost heap or garden beds. Directions for use with the Wyndywood Bokashi Bin. Step 1: On average, spread a layer approx 1/3 cup over untreated organic waste at the end of each day in your Bokashi Bin. Step 2: Use a masher to compact waste to draw out liquid to drain from tap every couple of days. Every year, tonnes of dog and cat waste is dumped into landfill in Australia. A lot of it also goes into our storm water systems and waterways. But like all organic waste, animal droppings can also be valuable to soils when recycled because of the nutrients they contain. Shift Bokashi Grain is a blend of natural beneficial microbes, minerals and absorbent materials that is specially produced to recycle animal waste into a beneficial resource. By recycling animal waste, its minimizes the amount going to landfill, odours in these areas as well as insect infestation. Beneficial microbes in Shift Bokashi Grain breakdown these substances quickly and effectively, as well as out-compete any disease carrying germs and pathogens in the animal waste.